For Brian Ross, August 2019 can't come fast enough. That's because the president and CEO of Experience Columbus has lots to tell the approximately 3,200 association executives who will come to town at that time for the annual meeting of the American Society of Association Executives. He knows that besides learning and networking, attendees will be evaluating Columbus as a destination for their own events. The latest development Ross is eager to discuss is a new guest-room tower at the Hilton Columbus Downtown. 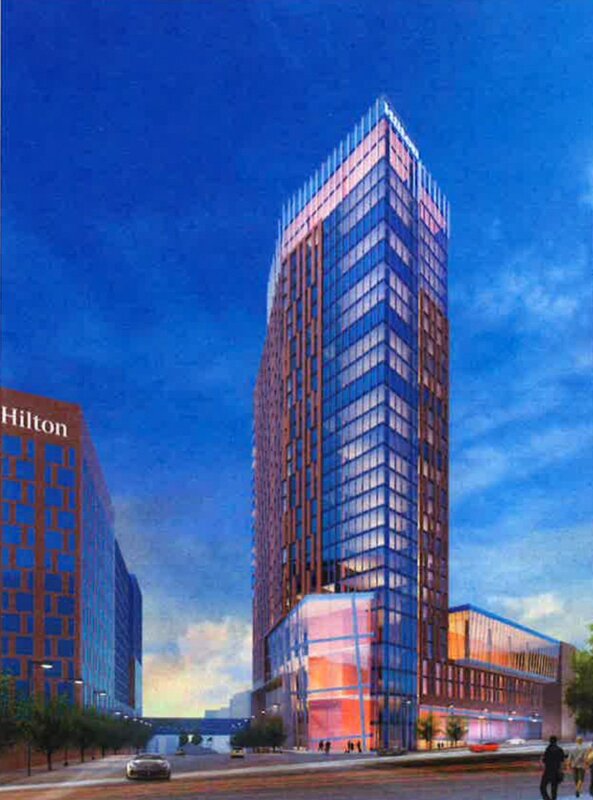 Presently a 532-room property, the Hilton will by late 2021 add another 470 rooms in a 26-story tower connected to the Greater Columbus Convention Center. An 18,000-square-foot ballroom, 42,000 square feet of additional meeting space, and a top-floor restaurant are also part of the plan. This development, coupled with the July 2017 unveiling of an expanded and refreshed Greater Columbus Convention Center, finally gives Ross and his CVB staff a compelling story to present to groups that need a headquarters hotel with more than 1,000 rooms. Hilton Columbus Downtown's new guest-room tower opens in late 2021. MeetingsNet recently caught up with Ross to get a fuller picture of Columbus' growing presence in the association meetings market. MeetingsNet: Why is a single hotel expansion so important to Columbus' ability to host large conventions and shows? Ross: The new tower goes hand-in-hand with the convention center expansion and renovation we did in 2017. Against our competitive set [Charlotte, Cincinnati, Cleveland, Indianapolis, Kansas City, Louisville, St. Louis, Nashville, Milwaukee, and Pittsburgh] we now have the fourth-largest center in term of contiguous exhibit space, at 373,000 square feet, but our convention hotel inventory is presently last in that set. The additional guest rooms we're getting will bring our inventory to more than 5,000 rooms downtown, with 2,725 connected or adjacent to the center, and that allows us to secure much more business in the 1,000-room to 3,000-room peak-night range. In short, we're now able to capitalize on ASAE's core of annual-meeting attendees who run professional associations. MeetingsNet: What kinds of groups are a good match Columbus' corporate base, universities, and other intellectual capital? Ross: Another reason the ASAE attendees are so important to Columbus is because about 30 percent are from the medical industry, and we have a tremendous medical infrastructure here with Ohio State University, OhioHealth, Nationwide Children's Hospital, Mount Carmel Health System, and others. Also, a big number of ASAE attendees represent associations related to higher education as well as technical learning, like the American Engineering Society. We are really well positioned from an intellectual capital standpoint to support those groups. MeetingsNet: Even though the new hotel tower won't be completed by August, how much do you think hosting the ASAE annual meeting will help your city to lure more association events? Ross: It has already raised Columbus' profile nationally as a convention location. Talk of the show has created a buzz for us in Chicago and Washington, D.C. We were not really on the radar in those places before. Right now, we are getting lots of inquiries and booking some business because of the ASAE show, and we're still nine months out. It's pretty exciting.